Hello! I´m back! after I think almost 2 years hehehe. anyway, I´ve been working on this wall for over 2 weeks, ummm, well it´s tsuna, no text, no meaning, nothing, just the image. Painting style combined with vectors, hmmm. that´s all hehe. hope you like it. jajaja i love your vector ^^! man someone beat me to this lol not that i was ever going to finish. i think the hair is really odd, but the rest of it is nicely recged. Awesome job! Love the flame and your painting/vector styles! His hair look pretty details too ^^ And it's Tsuna! Hahaha! 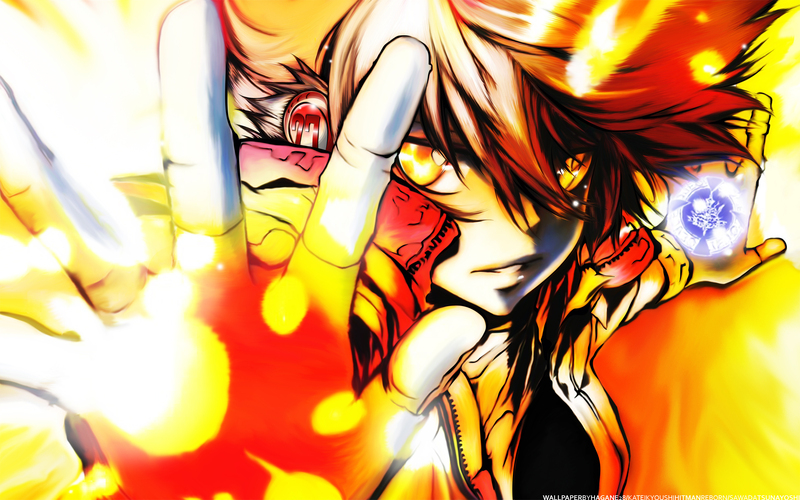 Tsunayoshi is more cooler than before,good job! The scan you chose is pure awesome and you did it great justice. oh cool! i love the colors! so fiery! and tsuna-san looks sooo cool! i was wondering is that a millefiore jacket he's wearing? Wow. Love the image and the colors..it's just wow. Thanks for sharing! I'm a big fun of the anime and now a big fan of your art work bless son.